Vienna Thos edition was published by Sambucus (János Zsámboky, 1531-1584), Hungarian humanist polymath, whose work also included topography. 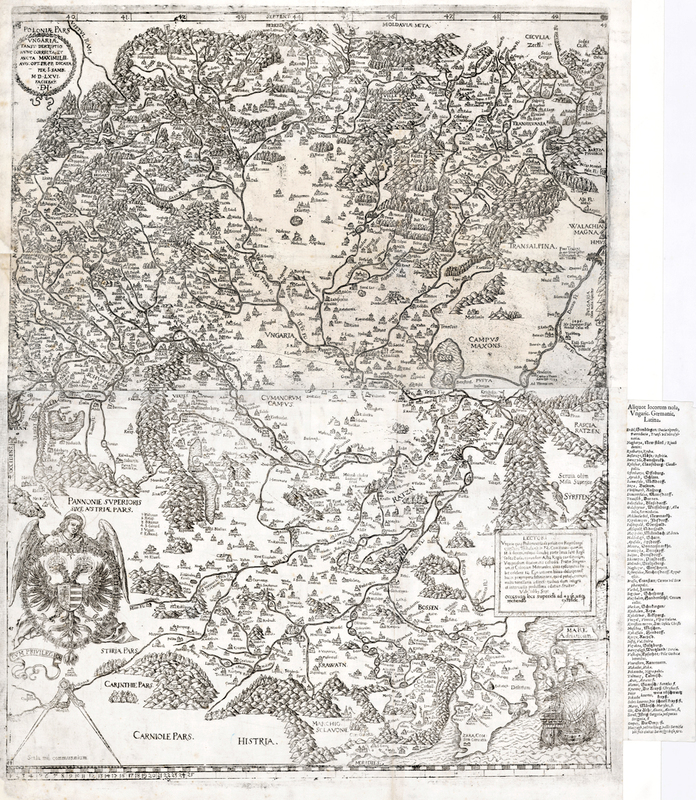 His maps, including his Tabula Hungariae published in 1566, weren’t original works, but copies of other maps with additions by himself. The copper plate used for this map was made by Donat Hübschmann (1540-1583), carver from Leipzig, whose name can be found in the map’s description. According to a surviving note, Zsámboky received one gulden for publishing the map. Johannes Honterus’ (1498-1549) Corographia Transylvaniae Sybenbürgen (Basel, 1532) and Wolfgang Lazius’ (1514-1566) Regni Hungariae descriptio vera (Vienna, 1556), because these maps are highly similar in content to the Tabula Hungariae, although they differ in visuals. Maps of Hungary made and published during the occupation contain several elements of the Tabula Hungariae. This way, cartographers have kept the values and unique characteristics of the first map of Hungary alive for a long time.